Share your Mass Effect hero with your fellow gamers! Email or Secret Word: Optional. Your email will not be shared or sold to anyone and it won't be visible. Entering an email allows you to edit your entries after submission. Alternatively you may provide a secret word of your choice which will have the same effect. You will be asked for it whenever you try to edit your submission. Based on: Optional. Is your character based on an actor or a character from a movie? Optional. This field and others will be searchable via a search box. Creation Code: Required. The code you get in the game. You can copy/paste it from the Lazurus project area. If your link points to a website that contains your image, right-click on your image and view it's properties to find out the actual URL of the image itself. A short description of how to use a head-morph file: after opening Gibbed, open the target save, switch to the Appearance tab and click Head Morph, then select Import From File, select the downloaded headmorph and save afterward (new save is recommended, in case there's an error). When modifying a face I'd recommend using a changelog. So when you restart the game to change something in the creation screen, you'll know the changes that were made and they can be re-applied easily. Also remember to save a duplicate file or folder before changing anything. Many of the described color changes apply to Femsheps only. Changing colors is about intensity and balance. The higher the numbers, the brighter the color. The closer the colors are together, the grayer or whiter the resulting color will be. So, if you want purple, make sure blue and red are higher in value than green. If you want a lighter version of the same color, multiply all three values separately by say 1,2 or 1,5. Gibbed's newly added Color Editor may make things a bit easier too. Adjusting the V- value is an easy way to get a lighter or darker color. Hair color can be changed under HED_Hair_Colour_Vector. To add a colored glow to hair shine, change the values under Highlight1Color and Highlight2Color. This can give you a green shine on purple hair for example. Lip color is HED_Lips_Tint_Vector. To see good results the scalar parameter also needs to be changed in Scalar Parameters. Eye shadow color can be changed under HED_EyeShadow_Tint_Vector. This changes the color of the eyeliner around the eyes. HED_Brow_Tint_Vector changes the color of the eye shadow on the eyelids. The result really becomes clear when the scalar parameter is also changed. Blush color is HED_Blush_Vector. Once again the result is best visible when the scalar parameter is also changed. Blush is easily changed at HED_Blush_Scalar in the Scalar Parameters. By adding steps of +0,1 or +0,2 to the current value, the intensity can be altered. Often I end up using around 1,0. Lip gloss is changed at HED_Addn_Spec_Lips_Scalar. Usually adding +0,1 or +0,2 will do. Lip color intensity can be determined at HED_Lips_Tint_Scalar in the Scalar Parameters. If no color was chosen in the Vector Parameters, this setting enhances the normal (red) lip color. This one reacts strongly, so steps can be as small as 0,01. I usually start at +0,1 to +0,2, depending on the desired result. Hair shine is adjustable under HAIR_Spec_Contribution_Scalar. In ME3 adding around +0,1 or +0,2 is usually enough. It also works together with HAIR_Shine_Desaturate_Scalar, which reflects colored lights (in ME2 between 0,5 and 1,0). 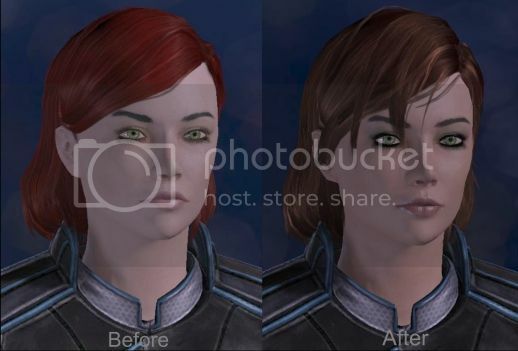 Hair is already pretty shiny in ME3, but in ME2 I used this setting to add more shine to Julie's hair. Hightlight1Intensity and Hightlight2Intensity can be used to enhance the colored highlights determined in the Vector Parameters. I often add +1 to both values. Eyeliner intensity can be changed under HED_EyeShadow_Tint_Scalar. This is the (black) line around the eyes. In ME3 I often find setting it to around 1,5 is sufficient. HED_Brow_Tint_Scalar enhances the color of the eye shadow on the eyelids. Mostly I set this between 0,5 and 1,5. The facial textures consist of two important parts: the diff and the norm. The diff is the actual texture that has the color and freckles and such. The norm is an added layer that reflects the light. To improve the standard textures I sometimes swap the norm texture for a different one. For Femsheps, the third complexion option (freckles), can benefit from using the norm that belongs to the first complexion, to give it a more silky look. Changing the mouth and the rotation of the eyebrows can be done in the Offset Bones section. The x,y,z numbers are somewhat like coordinates, which determine the location of these points relative to a central (invisible) point. To keep things manageable, I generally ignore the - (minus) before a current value. So, adding -0,2 to the y-value means: (Y) 4,766737 - 0,2 = 4,566737. And adding +0,2 to -4,766737 means -4,966737. The eyebrows attach at two points: Brow_(left + right) and outBrow_(left + right). Brow is closest to the nose. For lifting the outBrow_(left + right), add steps of +0,1 to the z-value, usually around +0,3 in ME2. Adding similar values to the y-value stretches the brow outward. If the outBrow is moved more than +0,3 however, the x-value may need to be adjusted a little ( -0,1 / -0,3) because of the curving of the head. In ME3 lowering the outBrow often seems more appropriate, for a more friendly face. Lifting the inner brow (Brow_left + right) can be done by adding steps of +0,1 to the z-value. This helps with some minor eyelid issues in ME3. Moving the bridge of the nose inwards/ outwards can be done by adding steps of 0,1 to the x-value of Sneer. The mouth can be changed a lot, but needs great care to avoid issues in conversation scenes. For a smaller mouth, add between +0,1 to +0,3 to the y-value under outerUpperLip_(left + right). For smaller lips, add between -0,1 and -0,3 to the y-value of lowerLip_Left + right or to the upperLip_Left + right. Be sure to check the in-game animation after changing these. To lift the corners of the mouth add between -0,1 and -0,3 to the x-value of outerUpperLip_(left + right). This helps faces a lot in ME3, since BioWare has made all mouths look somewhat sad, by lowering their corners. * The resulting numbers are slightly different for each morph.